Like many industries, healthcare is riddled with group think and “trends” that don’t materialize. Billions of dollars and, more important, irreplaceably scarce professional and managerial time and effort are wasted chasing opportunities that are really not opportunities at all. Jeff Goldsmith is a powerful antidote to group think. No-one can predict the future with unerring accuracy. But with more than thirty years of experience spanning all the major sectors of the health field, Jeff can help sort the trivial from the significant, and explain in English where the real opportunities and challenges lie- without fear or favor. What Will the Trump Presidency Bring to Healthcare? : Donald Trump won an unexpected Presidency in part by promising to repeal ObamaCare, the landmark 2010 Obama administration health reform law. This law provided coverage for 20 million formerly uninsured people and hundreds of billions in new funding for hospitals and care systems. How will unwinding and replacing this law affect those who render care? What role did poor health play in Trump’s election? How will a divided Republican Party decide where to cut and how to restructure Medicare and Medicaid, the twin mainstays of public funding for health services? Where will Trump succeed and where will he fail? What strategies best position hospitals and physicians to cope with a new wave of policy uncertainty? 2037: A Healthcare Odyssey: In 1986, in Hospitals’, Jeff Goldsmith looked ahead fifty years to the US healthcare system in 2036. In 2016, Jeff revisited these forecasts, noting both accurate and inaccurate predictions, and looked ahead yet again to the health system in twenty years time. In 2037: A Healthcare Odyssey, Jeff examines the digital health revolution he foresaw in his 1986 piece, and how it is likely to affect care. He also looks at the concluding chapter of the baby boomer’s saga, as well as promising new progress in the neurosciences and produces a fresh forecast for the US health system in twenty years. What if the Crowd is Wrong: Six Debatable Propositions about the Future of Healthcare and What They Mean for Strategy “Everyone knows” what the future of US healthcare looks like. It’s unanimous! We’re moving from “volume to value”. We’re shifting from “treatment to prevention”. Integrated Delivery Networks (IDN’s) are the future of healthcare organization. “Disruptive technologies” will undermine the traditional businesses of hospitals and physicians. And empowered consumers will force the health system to be accountable for the cost of care and move healthcare markets.This talk asks the provocative question: what if these things don’t actually happen? Where does it leave healthcare systems, professionals, insurers and vendors? How would your strategy change if the future actually turns out to be different from what “everyone” expects. Jeff Goldsmith talks about the future of healthcare payment and delivery reform, how it is affecting local markets around the US and talks about the “no regrets” strategies that position healthcare’s major actors for an uncertain, post-health reform future. The Tragedy of Health Reform: Despite compelling unmet needs, the bold health reforms enacted in 2010 in the Affordable Care Act appear to be faltering. A lethal combination of political controversy, flawed design and incompetent implementation have put health reform in peril. What went wrong? How will the unfolding of expanded health coverage, increased regulation and new models of care and coverage affect the health system and society? Will employers abandon health coverage and push their employees into the Exchanges? Will the Exchanges revitalize or destroy private health insurance? How will health reform affect caregivers and patients? Will the Medicaid program sustain a 20% increase in enrollments? Can or should health reform be saved? A veteran health policy analyst looks at ObamaCare and looks ahead. Slouching toward Value: The Future of Health Care Payment: One major theme of health reform has been to change how healthcare is paid for to reward higher value care. In a $2.8 billion industry, the uncertainty about future payment models has created confusion about strategic direction in hospitals and systems, physician communities and health insurers, as well as anxiety among patients and their families. Ironically, a Democratic health reform has produced Republican outcomes- high degrees of consumer economic exposure, narrowing networks, and a welter of confusing new choices. Meanwhile, new payment models- pay for performance, bundled payment, accountable care organizations, patient centered medical homes- have been given fresh impetus. How will all these experiments turn out? How SHOULD healthcare be paid for? This talk focuses on the winners and losers in the search for more accountable and affordable care, and the models and strategies that are likely to prevail. Can Hospitals Survive? Hospital Strategy in a Maturing Market: After decades of seemingly continuous expansion, hospital inpatient utilization in the United States has fallen for five years in a row. Despite forecasts a decade ago of significant bed shortages, many hospitals and systems find themselves with excess capacity. At the same time, the uncertainties surrounding ObamaCare and the pressures created by the recession have stressed hospitals, resulting in declining earnings and increased pressure from physicians and patients. Merger and acquisition activity spiked after 2010’s health reforms, and continues unabated. How will the private insurance reforms contained in ObamaCare affect hospitals’ financial futures? Can hospital systems that have sought to become “unavoidable” through mergers survive the transition to narrow network insurance products and rising transparency and consumer choice? Can hospitals survive this transition? How can hospitals become the “hospitals of choice” in their communities and regions. These topics are all evolving at varying paces, as new knowledge and analysis becomes available. They are modular, and can be mixed and matched to respond to client interests and needs. No two versions of any one topic are the same. Clients are also encouraged to frame their own topics and challenge Jeff to address them. Jeff Goldsmith Ph.D. is President of Health Futures, Inc and National Advisor, Navigant Healthcare. He is also Associate Professor of Public Health Sciences at the University of Virginia. For eleven years ending in 1990, Jeff Goldsmith was a lecturer in the Graduate School of Business at the University of Chicago, on health services management and policy. He has also lectured on these topics at the Wharton School of Finance, Johns Hopkins, Washington University and the University of California at Berkeley. Jeff Goldsmith’s interests include: biotechnology, health policy, international health systems, and the future of health services. 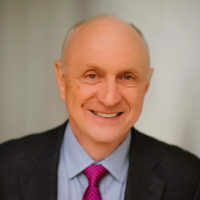 Jeff Goldsmith was the recipient of the Corning Award for excellence in health planning from the American Hospital Association’s Society for Healthcare Planning in 1990, and has received the Dean Conley Award for best healthcare article three times (1985, 1990 and 1995) from the American College of Healthcare Executives. He has written six articles for the Harvard Business Review, and has been a source for articles on medical technology and health services for the Wall Street Journal, the New York Times, Business Week, Time and other publications. Jeff Goldsmith is a member of the editorial board of Health Affairs. https://cbaspeakersbureau.com/wp-content/uploads/2018/04/Jeff-Goldsmith-e1523394417302.jpg 200 200 Carole Barnes https://cbaspeakersbureau.com/wp-content/uploads/2018/07/Home-Page-Header-2.jpg Carole Barnes2018-04-11 05:27:332018-07-26 18:59:16Jeff Goldsmith Ph.D.